Pazin is the administrative center of the Istrian region, situated in the very heart of the peninsula. It is a small city of fairy tale beauty, with medieval architecture, untouched scenic nature, pleasant people and dream-like gastronomy. With its surrounding medieval settlements, it represents continental region of the Istrian peninsula, often dubbed the “green heart of Istria”. Pazin and its surroundings are perfect tourist destinations if you prefer peaceful rural settlements with rich history and great gastronomy over crowded seaside resorts. Pazin is a typical medieval settlement, with the well-preserved Castle from the 10th century. This magnificent monument is situated on the cliff atop the Cave of Pazin. It is the unique work of nature where the stream of river Pazincica ends its flow above ground and continues its underground journey. Such magical sight inspired many artists throughout the history, Joules Verne being among them. It is believed that the plot of his famous novel Mathias Sandorf partially takes place in Pazin. 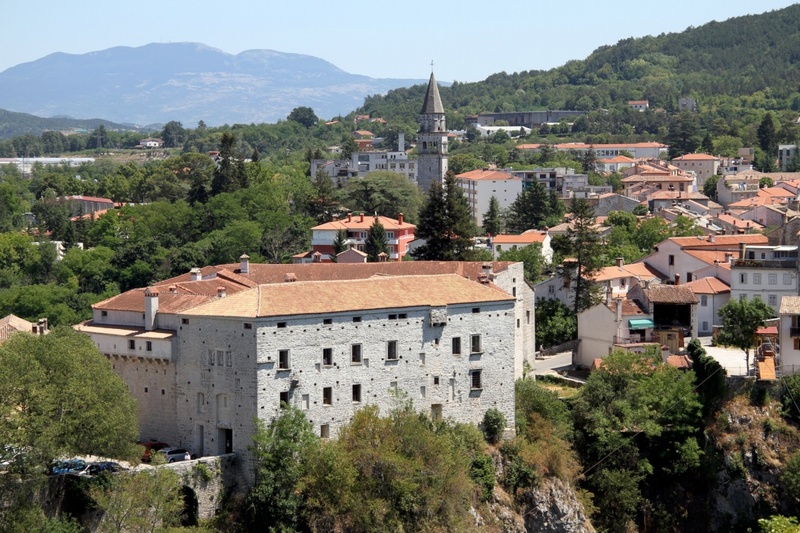 If you decide to stay in Pazin, there are several accommodation options; there is a small family hotel Lovac in the city and numerous private accommodations as well as tourist settlements. Make sure to taste praised local cuisine specialties during your stay. There are numerous restaurants, taverns and rural households where you can enjoy some of the best Istrian dishes. And if your desire for adventure still isn't satisfied, you can head towards one of the numerous nearby settlements in central Istria and explore their sights and natural beauties hidden beneath medieval walls. Twenty minutes long drive from Pazin towards south will take you to Motovun. It is a lovely medieval settlement situated on the hill above the river Mirna. Motovun is very popular among film lovers for the past few years as a venue for the beloved Motovun Film Festival. The nearby Motovun Forest is a natural habitat of the appreciated Istrian truffle. If you head further to the north, you will arrive to Buzet, an ancient settlement with the remains of the Roman fortifications. This charming settlement is also known as the “city of truffles”. In the immediate proximity to Buzet there are Roc, an active cultural center of the region, and Hum, the smallest city in the world with only 18 inhabitants. Between these two settlements is a path dedicated to the Croatian Glagolitic culture, The Avenue of Glagolitic Scholars. There are numerous hiking and cycling trails in the area leading to the highest peaks of Ucka. It is the natural reserve and one of the last places in Europe to see the magnificent mountain birds, griffon vulture and the golden eagle. If you head towards south from Pazin, you can visit Zminj, the local center of agro-tourism where you can find cozy accommodation and enjoy the home made specialties of the Istrian cuisine. And if you continue your journey further down south, you will reach Svetvincenat, a lovely settlement with romantic renaissance square and scenic sights ideal for artistic inspiration. Find information about selected Hotels, apartments and rooms in Pazin to choose the perfect place for your accommodation.